St. George’s Episcopal Church has been helping families for over five years with our church emergency food pantry. Every Friday from 10 to noon, we open our doors of our food pantry to anyone who needs food. No questions asked. We have a dedicated group of volunteers that treat those who come with love and respect. We started out small, but have grown to helping an average of about 50 – 60 families a month. We are a small congregation, but mighty in spirit. 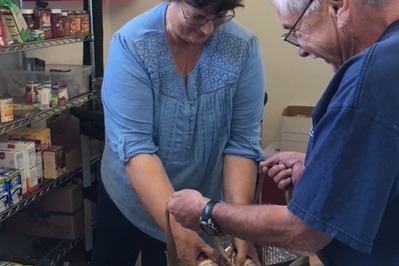 For the past 5 years we have been able to obtain food through the Monterey County Food Bank with donations from our congregation and the help of a $1500 grant. We were unable to obtain that grant this year. In looking for other grant money, we found organizations that provide grants, wanted to help start-ups, not existing food pantries. The need continues to grow, but the finances of our small congregation are stretched. So, I thought I would give our wider community of family and friends the opportunity to donate to a worthy cause that has absolutely no overhead. 100% of your donation will go to buy food for those who come to our emergency food pantry Friday. Thank you for your support and may God bless each and everyone!